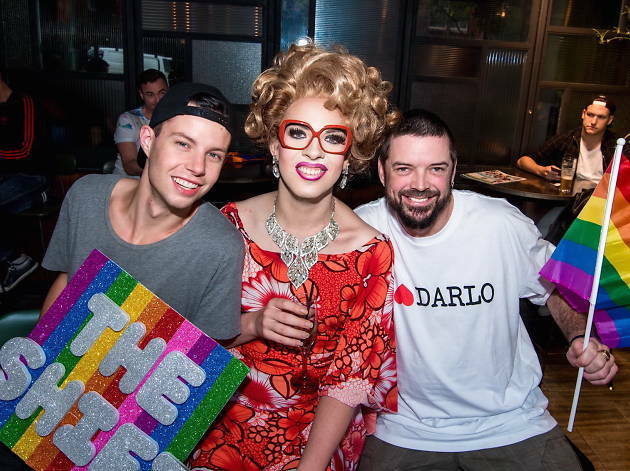 Oxtravaganza will take over Oxford Street for a third year with live music, drag and special deals enlivening your Darlinghurst shopping trip. As an historic stomping ground for queers, bohemians and artists, this cultural hub of performers, creators and hospitality providers is inviting Sydney to share in their creativity from midday to midnight on February 23. To fuel your day of party-shopping, stop in at one of the venues offering Karma Kegs donated by Young Henry’s. By buying a schooner of this brew at watering holes like the Oxford Hotel and Darlo Bar, you’ll be sending all the proceeds straight to Oxtravaganza’s charity partner Twenty10. All fundraising goes towards the organisation’s huge variety of support and advocacy services for LGBTQIA communities in NSW. Once you’re well hydrated, seek out events like drag yoga at Esca Café, cabaret at Claire’s Kitchen at Le Salon, and the two live performances by the Voice star and Oxtravaganza’s ambassador, Sheldon Riley. You’ll find throngs of dancers getting down to DJs and disco on the main thoroughfares, down alleys and in stores. You can get a glittery makeover at local hair salons and make-up studios, do the same to your wheels at Lekker Bikes and find fabulous racks of Mardi Gras threads inside Crown Street vintage stores. In addition to retail specials and food and drink packages across the area, there will be a special focus on creative industries, with an art and design market setting up at Oxford Square, as well as a creative laneway with stalls, music and entertainment opening onto Foley Street. This will showcase local makers offering art, jewellery, fashion and homewares, as well as those sharing their craft in workshops.